AGU Fall Meeting 2013 – San Francsico, CA – Matthew V. Bilskie, Ph.D.
M.V. Bilskie, S.C. Hagen, S.C. Medeiros, D.L. Passeri, “Sensitivity of hurricane storm surge to land cover and topography under various sea level rise scenarios along the Mississippi coast.” AGU Fall Meeting 2013, San Francisco, CA, December 9-13, 2013. Abstract: Major Gulf hurricanes have a high probability of impacting the northern Gulf of Mexico, especially coastal Mississippi (Resio, 2007). Due to the wide and flat continental shelf, this area provides near-perfect geometry for high water levels under tropical cyclone conditions. Literature suggests with “very high confidence that global sea level will rise at least 0.2 m and no more than 2.0 m by 2011” (Donoghue, 2011; Parris et al., 2012). Further, it is recognized that the Mississippi barrier islands are highly susceptible to a westward migration and retreating shoreline. With predictions for less frequent, more intense tropical storms, rising sea levels, and a changing landscape, it is important to understand how these changes may affect inundation extent and flooding due to hurricane storm surge. 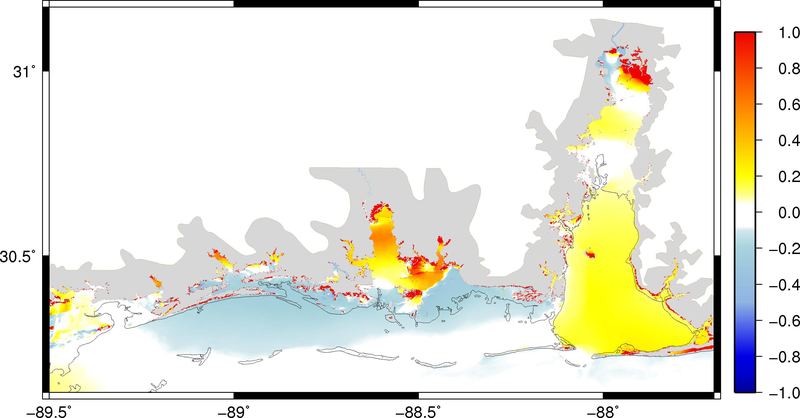 A state-of-the-art SWAN+ADCIRC hydrodynamic model of coastal Mississippi was utilized to simulate Hurricane Katrina with present day sea level conditions. Using present day as a base scenario, past (1960) and future (2050) sea level changes were simulated. In addition to altering the initial sea state, land use land cover (LULC) was modified for 1960 and 2050 based on historic data and future projections. LULC datasets are used to derive surface roughness characteristics, such as Manning’s n, and wind reduction factors. The topography along the barrier islands and near the Pascagoula River, MS was also altered to reflect the 1960 landscape. Storm surge sensitivity to topographic change were addressed by comparing model results between two 1960 storm surge simulations; one with current topography and a second with changes to the barrier islands. In addition, model responses to changes in LULC are compared. The results will be used to gain insight into adapting present day storm surge models for future conditions. Parris, A., Bromirski, P., Burkett, V., Cayan, D., Culver, M., Hall, J., . . . Weiss, J. (2012). Global Sea Level Rise Scenarios for the United States National Climate Assessment NOAA Tech Memo OAR CPO-1 (pp. 37). Resio, D. T. (2007). White paper on estimating hurricane inundation probabilities (pp. 125). Vicksburg, MS: U.S. Army Engineering Research and Development Center.